High dust holding, high filter efficiency, easy to fold. A:Mechanical air filters remove particles from the air stream because particles come into contact with the surface of fiber in the filter media and adhere to the fiber. Q: What kind of air filter you make? A: Pre (synthetic ) air filter; pre panel filter, medium pocket air filter, filter box, hepa air filter, activated carbon filter, Fiberglass panel filter, Fiberglass floor filter, ceiling filter, spray painting booth filter. Filter bag, cartridge filter and all customized filter solution. Q: Are you really manufacturer or trading company? A: We are indeed filter material manufacturer, produce all kinds of activated carbon filter materials and activated carbon filters. 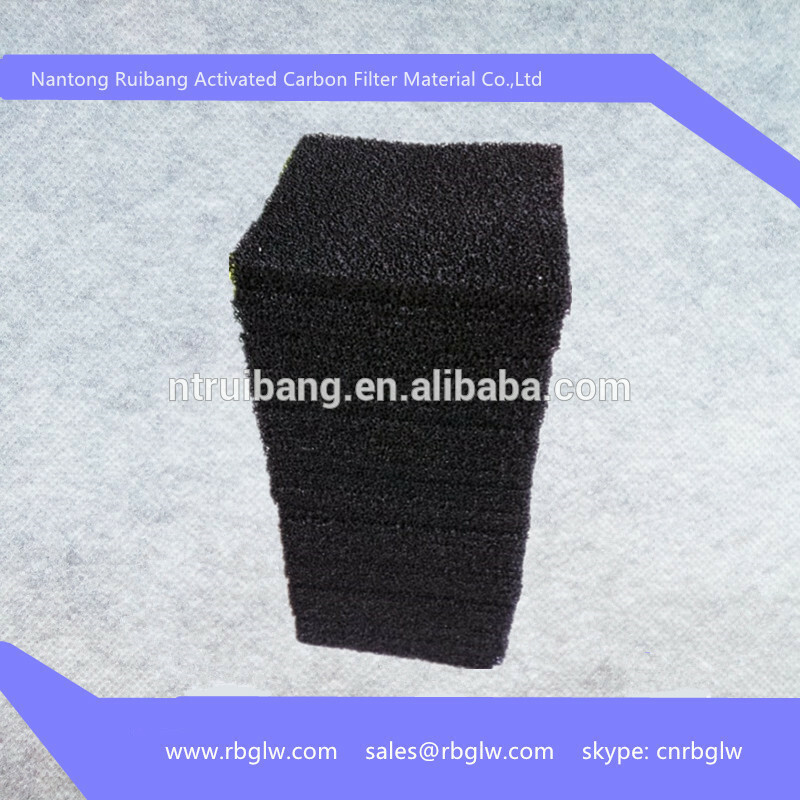 Products include activated air filter, activated carbon fiber, active carbon sponge, fibrous activated carbon filter, corrugated active carbon filter, nono anti-bacteria fiber, activated carbon mask cloth, floor charcoal cloth etc. Q: Where is the activated carbon filter generally use for ? A: HAVC (Heating ,air conditioning and ventilation system ) Spray painting stop, chemical plant, pharmaceutical plant, cement or asphalt powder plant, clean room, power station, heavy and metal industry, Gas turbo and Co-generation utility plants,Engineering and devices plants, dry and bake room. Hospital, computer centers, cars, gas and water purification, etc. The products are widely used in the area of environmental protection, military, aviation, oil, chemical industry, nuclear industry, automobile, medicine, textile, food, electronic, sanitation and so on. Q: How should we choose the suitable activated carbon filter material? it depends on the industry you're going to use. also depends on which level of efficiency you need, pre, midium or high absorption. which type? 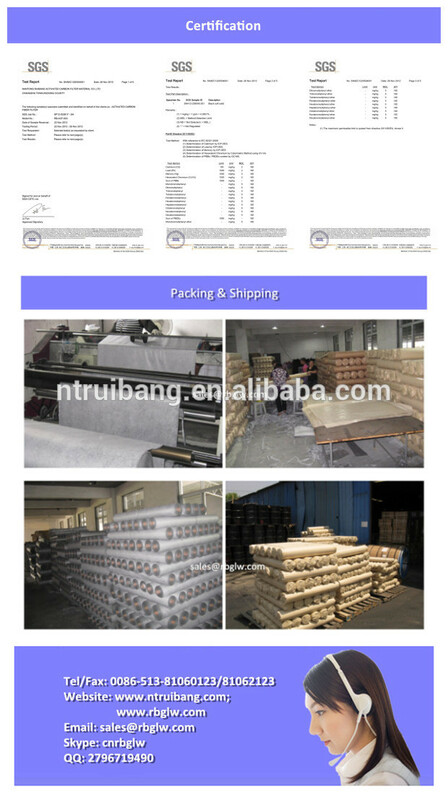 Sponge foam, fibrous, cloth? which style?honeycomb, fishing net, zeolite?photocatalyst?cold catalyst?conductive?composite? Q: How should we choose the suitable air filters? Pre filter suit to 5um or above. Hepa filter use for up to 0.5um particles. It also depends on the temperature and odor to pick up different types. Q: Could the filter use for high temperature circumstance? A: yes, we could use the high temperature media, frame and sealant to meet the hight temperature working condition, such as for furnace and baking room. Q: What is the international standard for air filter? Q: What’s your testing standard? Q: Do you have any certificate to ensure the quality? A: Yes, we have Rohs certificate from SGS. A: It depends, generally 100 pieces for per type and ,10 rolls for roll up media. Q: What price term do you accept? A: Normally quote FOB price or CIF, others as per to customer required. A: We currently do 40% deposit and 60% pay before shipping. Or L/C at sight. Sample amount less than $1000. Q: Do we have some free samples for testing or checking? A: Yes, one pc of free sample available only. But the courier or shipping charge will be on customer account as per our company policy. Q: How long will be the leadtime for samples and production? A: Generally, it takes 3-4 days for sampling, and 2-3 weeks for production. As if volume order, pls check with our sales.